Above, an excerpt from the 1952 book “Sewing Made Easy”, by Mary Lynch. Over the weekend I did a bit of destashing of bins and bins of fabric remnants that I had let pile up in my craft shed and barn. I will be filling up my Suburban with the unloved fabric to donate to The Legacy in Sebastopol, one of my favorite shopping spots. Most of the fabric I saved is vintage and it desperately needed organizing. I like to roll and cigar-wrap my remnants, but rarely take the time to do that. On Sunday, I designed some wraps to print out to motivate me to get ’er done. And of course, I made them for you, too. For free PDF downloads of the wraps to print out, click HERE for the shorter ones and HERE for the longer ones. I will keep extra wraps on hand in my sewing nook to wrap remnants as I get them from now on. I cut along the margin edge of each sheet to remove the white non-printed section (so when the bands overlap, the image blends onto itself,) then cut between each graphic to make the strips. 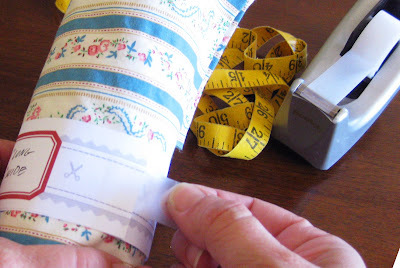 Before rolling my fabric, I measured each and wrote the dimensions on the label of the wrap. I placed a 12-inch piece of tape on the table as a folding guide so that all my rolls would be uniform in length. I folded each fabric piece to that width, folded back the raw edges and jelly-rolled, folding in the end raw edges before finishing the roll. I wrapped the roll with the band and secured with clear tape. I’ll be storing my remnants in vintage non-smelly luggage. This entry was posted in Uncategorized and tagged Free Blog Gadgets, Free digital downloads, organizing fabric, PDF downloads, vintage fabric. Bookmark the permalink. This is great and I hope someday I will actually do this:-) Right now, my little piles are folded neatly under my bathroom sink… of all places!?? You have to be the most organized person I've ever seen! Those remnant wraps are ingenious! You'd think that after 50 plus years of sewing and working retail fabric stores, that I would have thought to do my remnants that way too. Thanks for adding another 'to do' item to my list…JK…. something to do when I have nothing else to occupy my hands..lol. 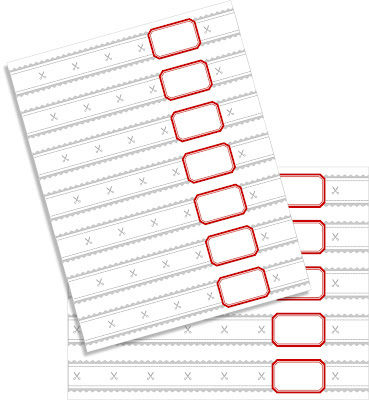 The printable strips are wonderful, and I thank you for allowing us to share in your organizational abilities! organization at its finest! how nice! THAT is such a fantastic idea!!! When I see your postings on something like this, I think, "Why haven't I thought of that?" LOL Actually, you have me brainwashed…every time I see a little bird, I think of you! What a super idea, thanks for sharing the wraps with us, now there is no excuse, except maybe lack of time. Wow – very organized! It looks so nice tucked into the vintage trunk. Thank you for sharing! What a GREAT idea! As I worked in fabric/crafts sales for more years than I care to remember I know your idea is one of the best ways to organize and store your fabrics! THANKS so much for sharing the wrapper with the rest of us! What a wonderful idea & as always thank you so much for sharing. Looks so organized I love the idea ! What a great idea – I wish I could be as organised as you! I love your remenant labels. Fabulous idea!! So organized, sometimes you really just have to take some time and get you stuff together. It certainly helps later on when you are looking for a particular item. Thanks so much for the lovely tags wrappers. My life is becoming nice and neat, thanks to you!! reading the other comments I just want to say DITTO. DITTO. DITTO. 😀 Awesome, thank you for sharing too! I just want to come and spend a week with you. Check out all your awesome items and go to that incredible flea market with you. Me and probably 1000 other people! That is pretty nifty. I love the idea and will have to use it. Thank you for the free downloads. You can't imagine how timely this is, as I am reorganizing and purging my fabric stash. Thank you! Gracious, you are just to cleaver, creative and organized. Want to come over to my craft room? What a great idea. Thank you for sharing your talent with us. It is muchly appreciated. ok you are just amazing….simply amazing…I have never seen anything like it or met anyone like you. I am so jealous….I wish I were your neighbor. Love them and am going to tell my sewing buddies! Ooh! I love the organization Cathe! It sure makes life so much easier. Your blog is delicious! That is such a lovely idea and thanks so much for the wraps. I really need something that works for smaller pieces and this looks such a good idea. Thank you…this is just the kick in the pants I need to get my fabric sorted out and organized. It's super nice of you to share these with all of us! Thank you so much! I have been sorting my stash – again. This will be a lovely way to get it to a more usable state. have another nickel Cathe, because seriously – I don't know how you do it! So organised! Perhaps it's time for me to tackle the attic full of remanants now. Thanks Cathe! I feel so much better about my supplies and more motivated and creative when everything is all pretty. You're a gem! What a great idea, if I ever get organized, I'm using this! thank you so much for sharing! 🙂 have a GREAT day! What a clever idea and it was so kind of you to share. Thank you. this is an awesome idea. thanks for sharing! This is wonderful. There are two closets in my tiny San Francisco closet, and one is completely filled to the brim with fabric. Organizing would take a long coffee-fueled weekend, but I can see it would be well worth the effort. Thank you for the wonderful idea! These are awesome and SO CUTE! I love them! Thanks sooo much! I'll be linking. This is a brilliant idea and your timing is perfect. I want to de-stash and give to an organization for use in charitable projects. Your idea(s) work great for giving them the fabric pieces in a presentable way but useful as well with the labels. Thank you so much. I just wanted to say thank you thank you thank you for all of these goodies! Oh and also mention how jealous I am that you're in NorCal close to Sebastopol. I spent most of my childhood in Santa Rosa and I miss the west coast even tho I was also from Missouri where I am now. What a great idea! I love the photo of all of your pretty fabrics in the luggage. Beautiful! Thanks. Love the idea. I have quite a bit a fabric at home I can do this with. I've googled dozens of different "craft terms + organized" and not found such wonderfully creative solutions to craft storage dilemmas. You make even the process of filing craft leftovers a joyful pastime, and then share your creative genius with people you'll never meet. What a sweetie! Thank you! 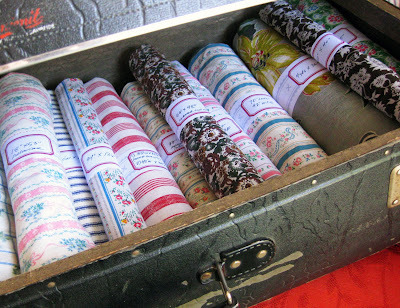 I wish I could organize my fabric like that. The best I've done is sort it by color in rubbermaid bins. Great way to keep yourself organized. Thanks for sharing!! Oh my gosh, look at that candy store in that drawer, what a delightful and fabulous idea! Thanks Cathe!! Ooooh, very nicely done and they all look so beautiful all rolled up and placed together like that! These are so pretty!! I organized some of my remnants with paper labels, but mine were just cut out of scrap paper and nowhere near as nice as yours. So simple and yet so brilliant! Why didn't I think of that? Thank you! I have a lot of fabric and remnants. My mouth is gaping open right now. Beautiful organization. Thank you. oh my gosh–these are great!!! such a wonderful idea! Nice blog. And I love love this idea….what a great way to get and stay organized. OK!! I printed out ten pages of these today and plan to tackle my boxes, and boxes, and boxes of fabric. Maybe…someday…i'll post a pic. Love, love, love these!! Thank you! If you print them on the full sheet labels, you don't need tape. But I wouldn't recommend that for finer/delicate fabrics. Just proves the simplest idea is the best. thanks I had fun this weekend tackling my stash of fabric remnants. What a brilliant idea! I just organized my fabric stash but I didn't label them. 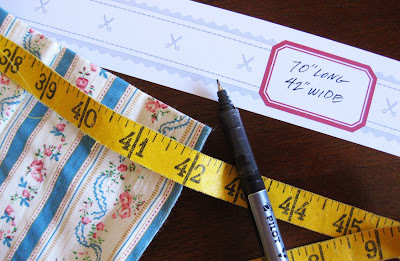 I think I'll go back and add the measurements using these labels. What a clever idea! 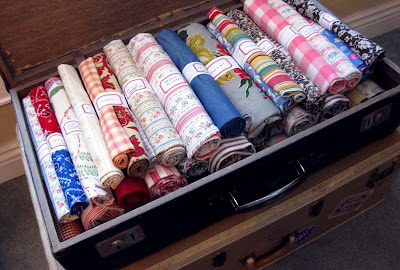 I have been storing my fabric in a wicker trunk since I started living in a travel trailer 9 years ago. Rolling like this would give me so much more room in there. Thank you! splendida idea…ho sempre un disordine nelle scatole delle stoffe…con le tue etchette – fascette sarà tutto più a posto. Thank you so very much for posting this! I've been losing my mind trying to keep track of my fabrics, and trying to keep everything from getting wrinkled when folded. Oh, I’m jealous of how neat, attractive and organized your fabric stash is! All your projects are inspiring, Cathe, and I really look forward to them. these are great! found you from shannon. Linking these up for my fat quarter fridays. Thanks – I found you on Etsy when I did a search in the forums for organizing fabric. Very generous of you and very helpful information and files! I so love this down load as I have so much fabric organize. Wow!! Great idea! Thank you. Boy do I need them now. Thank you for all your work. Love your blog. This is such a great idea! Thanks for these cool labels – have to get busy now! My stash certainly needs organizing. I love this idea, It will make me look so organized. thank you. Great idea! I just posted a link to this post on my blog today! Hopefully you will inspire others to organize their fabric! Thanks, Cathe! It’s been raining for 2 days, in sunny California and I’ve spent those days working to organize my fabric collection. I’m done with yardage and scraps. Now, I just need to deal with my remnant-sized pieces. I just printed your wraps and will begin organizing those, too. I’m actually enjoying myself! I appreciate your great ideas. Thanks so much for making and sharing this free pattern. I’ve been wanting to “file,” categorize, or something with all my stash. Right now, they are dumped in plastic bins that I don’t have room to store. Hopefully, this will help to minimize the room needed. Fabric stores use this for their remnants, so why not use in our homes. I love your ideas, and would like permission to post your site on my site that is not doing anything yet. Please let me know. Meantime, thank you for the organizing tips. I intend to use them right away. You are a doll! I love your idea of rolling fabric and the labels. I have so much fabric to organize and have been looking for a good way to do it. This is a wonderful idea, thank you so much for the printables. Rolling fabric/clothes takes up much less space. I always roll my clothes when traveling and when I go to thrift store bag sales. You can get so much more into the suitcases or bags. I wonder why I never thought of rolling my fabirc and labeling it. These are awesome, and you created these on a whim on a Sunday!! I wish I had your brain, I could come up with a lot of things thank you!! Thank you so much for sharing! I am in the process of moving from my temporary room into the Design Studio my husband created for me. This will really help me stay organized. thanks for sharing the handout of the strips! THANK YOU FOR THE IDEA AND THE DOWNLOAD. I HAVE SO MANY BITS OF FABRIC THAT ARE NOT JUST TINY SCRAPS. I OFTEN WONDER WHAT SIZE, WHAT THE YARDAGE IS. THIS, WITH LOTS OF STRING QUARTETS AND DWIGHT YOAKAM, WILL BE MY HOLIDAY WEEK PROJECT. What a fantastic idea! : I live in a small condo now.with.very limited space. One thing I do have.is old luggage! It would be easy to transport too! Thank you SO VERY much for the help. We are in fabric trade for last 45 years as retailers but I always wonder how to wrap the remnants. We used rubber bands and then stappled the tags etc but your printing of sheets with little cello tape works just fine, never thought about it. Thanks to you. A really great idea! I think I will steal it and do my best friend a favor while I housesit for her. Thank you for this great tip! Thank you ever Sew much for sharing this storage idea. I am inundated with scraps of all sizes and have organized precuts and yardage. However those odd sized scraps are still out of control. I tried wrapping them on cardstock but do not like the creases left in the fabric. Rolling is an idea that had not crossed my mind plus the labels are great. Thank you again! Thank You so much for the idea and the free PDF file to print. Now I’ll know how much fabric I have before I start a project instead of assuming. Thank You!!!! THANK SO MUCH! I was doing this but your wraps are awesome.